This discovery began when scientists’ observed partially eaten patches of algae – the preferred food of parrotfish – on dead coral skeletons on the Palmyra atoll, about 1,000 miles south of Hawaii. Scientists continued observing these bald spots over time and saw steephead parrotfish gorging on one small patch of algae. But the parrotfish moved on to another patch of algae before wiping out the first spot. In fact, the fish did not return to that first patch until more algae grew back, and they defended it against other grazing critters, giving the algae time to recover. This same algae is usually toxic to juvenile coral. So, when parrotfish scrape away the algae, they create an algae-free spot where new coral larvae can survive and grow. 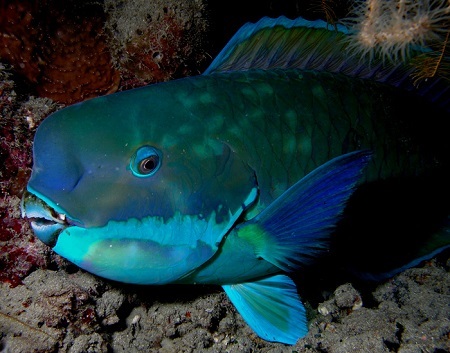 But overfishing has reduced parrotfish populations. Researchers therefore tracked parrotfish movements over several years, hoping to gather information to help develop effective conservation strategies. Biologists learned for the first time that parrotfish travel up to a kilometer from their feeding grounds, most likely to spawn offshore. Knowing how far parrotfish range from their feeding area helps researchers determine how much space around a reef requires protection for conservation. But scientists don’t need to worry as much about conserving the algae since the parrotfish help with that.